this. Your weight has no bearing on your worth as a person. If you feel like your current weight is stopping you from doing the things you want to do, you are wrong. It’s you stopping you. If you love and want to go swimming but can’t because you don’t want to wear a swimsuit, that is you stopping you, not your weight. If you go swimming regardless of how you think you look you will enjoy the swimming and get some exercise (which may even have the side effect of weight loss!) If this seems impossible then instead of a New Year’s resolution to lose weight, I recommend a resolution to seek out some therapy to help you to be able to do this. Be body confident no matter your shape (and it isn’t always people who have a high body-weight that lack body confidence). 2. Do I even need to lose weight? A “need” is very different from a “want”. If you have surgery coming up and the operation requires you to lose weight then you “need” to lose weight. Apart from that, there are actually very few reasons why you need to lose weight. Any other medical or health reason is much more likely to be connected to eating well than to your weight itself. So, if you have type 2 diabetes then although it is correlated to BMI, actually eating well is going to be more beneficial than just losing weight. For example, eating well for type 2 diabetes would include reducing refined carbohydrates and replacing them with wholegrains. Eating well for high blood pressure would be reducing salt, which for some people would mean cutting down on high-salt, ready-prepared, processed foods and eating more potassium-rich fruit and vegetables. Eating well for high cholesterol would mean reducing saturated fat and replacing it with mono- and polyunsaturated fats. As a side effect of eating well, weight loss often occurs causing a correlation with a reduction in symptoms. It’s not necessarily the weight loss that causes a reduction in symptoms, but the eating well. 3. What has happened when I have gone on a diet before? Did you enjoy the diet? Did you feel satisfied with the food you ate? Did you get through without craving foods you weren’t allowed? Did you lose weight? Did you stick to it until you reached your goal? Did you keep the weight off? If you answered “no” to any of these questions then it might be time for a rethink. Most people hate diets and most people gain weight once they stop. Often weight loss is quick at first and then it levels off and people give up and regain the weight – sometimes more than was lost. 4. How will going on a diet benefit me? Do you feel like everything will be better if you were just at a different weight? Do you blame your weight for you not having a good job or the right partner? Honestly, getting out of this mind-set is hard but you really should try. Not only is it probably not true, getting into the blame-game is really unhelpful. Or perhaps it is for your health. This is a really tricky one for me as a dietitian. I constantly struggle with how to deliver a health message without making people feel bad about their weight. It is true that abdominal fat is linked to conditions like type 2 diabetes and I really want to help people be healthy and prevent disease, but dieting rarely works. As a “treatment” it has a ridiculously high fail-rate and has horrendous side-effects. If it were a medication it would never reach the stage where it would be allowed to be prescribed. If most people who took a pill had the side effects of negatively affects social life; leads to constant hunger; leads to feelings of inadequacy and failure; leads to rapid weight gain on stopping; results in chronic dissatisfaction in food intake, not one single person would want to take it. Yet millions of people embark on diets every day and never more so than in January. 5. Do I know what I’m doing? Do you usually just buy the trending diet of the moment or do you go and get professional help? Fad diets are complex and hard to follow and although the may “work” in the short term, it’s usually because foods are restricted in some way and this is not very sustainable. So if not dieting, then what? Why not just start by making sure you give your body what it needs? Nutrients, pleasure, satisfaction. If you aren’t sure how to do this because you are bombarded with contradictory health messages then ideally find a dietitian (https://freelancedietitians.org) who will give you personalised advice – because not every piece of advice you might hear will be relevant to you – and support you with the things you need the most support with. Dietitians all have a degree in human nutrition and dietetics so are suitably qualified. 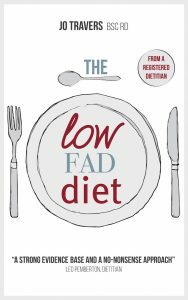 If your budget won’t stretch to this then The Low-Fad Diet is a book that can help you understand the basics of eating well and show you how to get a balanced diet. Jo Travers, The London Nutritionist and author of The Low-Fad Diet, is a Registered Dietitian with a First Class BSc (Hons) in Human Nutrition & Dietetics. She has been in private practice for five years, and in her media role has consulted for the BBC; Channel 4; and comments regularly in print and on radio (more often than not as the voice of reason when the latest outlandish food story hits the news). She is also a spokesperson for the British Dietetic Association.